The Wedding AlBUM CD DVD Release! GOOD NEWS! ON 9.29.14, WE RELEASED THE WEDDING ALBUM! WHAT IS THE WEDDING AlBUM? 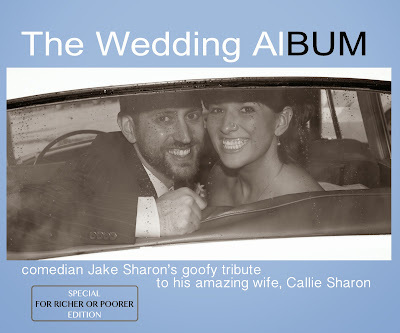 The Wedding AlBUM is my best comedy album to date. We recorded it at Austin's The Institution Theater March 28 and 29. Thanks to Voltaic Video Productions, the sound quality is amazing. We had 2 great crowds. To get myself ready, I traveled the country for 3 years writing, performing, and honing The Wedding AlBUM material. The Wedding AlBUM is all the best material I wrote and developed since meeting Callie in 2011. I tell stories about how my life has changed since meeting her. I write about the people I have met because of her. I even talk about our wedding night. I talk about how Callie's my hero. I am so proud of how it turned out! Pay what you want or get for FREE on Bandcamp! Listen on iTunes/ Apple Music! The DVD is no longer available! WHAT ARE YOU DOING WITH THE PROFITS? Good question. As part of my dedication to Callie, 100% of the profits go to the "Jake Has to Treat His Awesome Wife Real Good Foundation.” I set up a special fund with the sole purpose to spoil Callie- and she likes that. Flowers, dinners, whatever it takes to spoil her. As a comedian, I don't always have tons of cash, but I want to tribute my amazing wife. So I wrote an entire act about her and now I want to to spoil her with the profits. So, get The Wedding AlBUM and help me spoil Callie!